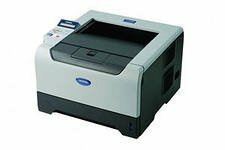 Brother HL-5250 is a black and white laser printer that has a print format A4. He had a pleasant and creative design. This printer is easily fit for small office and home use. Itself black and white laser printing is 28 pages per minute. There are also two-sided print, and connect to the network via Ethernet. Print resolution of 1200 x 1200 dpi. Noise at work standard 53 dB dimensions average 384x246x371 mm and a weight of 10 kilograms. Of the features of the present, toner save mode.